Oh what a summer we have had! To end the summer off with a bang, this newsletter is filled to the brim with natural tips and tricks that can help you look and feel your very best. From coffee subtitutes to clothing with a conscious and a simple little book that will change your life - there is a lot to learn and love. With back to school and everyday routine just around the corner, let's enjoy these last few sunny weeks. We have a lot of exciting announcements to share with you this Fall... so please stay tuned! As always I love hearing from each and every one of you. All questions and recommendations are welcome. My team and I are constantly testing new products so we can ensure we are offering you the very latest and greatest in natural healthcare. To reach me, all you have to do is email drjoey@drjoey.com Have a wonderful end to your summer! Did you miss Dr. Joey on Cityline? If so click here to watch! Do you have a food vice you can't give up? If so, click here to learn some healthier options to coffee, sugar, salt and more! Following the Cityline Weight Loss Challenge ?winners keep on losing and getting healthier and strong with Shulman Weight Loss behind the scenes! 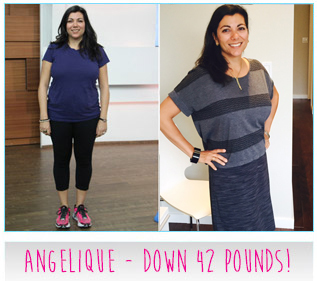 A huge congratulations to Angelique who has now lost 42 pounds and soon to go on our maintenance program. Why choose Shulman Weight Loss clinic? #1 clinic in the GTA! Looking for a balanced and uber yummy snack? If so... Simply Protein's newest Nut & Fruit bar is the perfect option! The peanut butter strawberry flavor includes luscious fruits, wholesome nuts, and easy to digest pea protein. Low in sugar, high in fiber and extremely filling. Even in August there are still bugs. 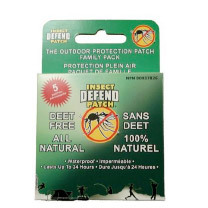 Available at most health food stores, the insect defend patch will keep mosquitoes and other critters away for up to 24 hours! This all natural, topically applied patch contains thiamin (vitamin B1) and is 100% DEET free. Apply within 2 hours of being outside. Raise your hand if you are a coffee lover. I do adore my morning cup of java, but find that more than one cup per day is a slippery slope. This is why I turn to Bambu coffee substitute after dinner as a natural and sweet option to coffee. 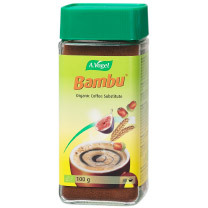 Made with chicory, figs, wheat, malted barley and acorns, Bambu coffee substitue offers a velvety smooth flavor with only 5 calories per serving! Just add to boiling water or almond milk, stir and enjoy a bit of coconut sugar if desired. When I have a present to buy, Tentree apparel is often my "go to". For every item of clothing purchased, 10 trees are planted in an area of the world that needs it most. When you purchase an article of clothing from Tentree, you can also visit the "tree map" to determine where your trees will planted. Extremely soft and cozy, great looking and environmentally conscious. This superfood mushroom drink mix is the perfect way to strengthen your immune system and decrease inflammation naturally. Chaga has exceptionally high antioxidant levels with 1 pack of chaga having the equivalent of 30 pounds of carrots! This delicious, dark drink is enhanced with mint and rose hip ? the perfect way to start your day. In each dose, there is 1500 mg of wildcrafted chaga dual-extract. 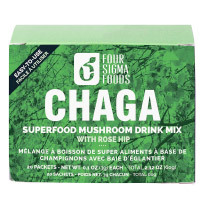 A box includes 20 packets of superfood mushroom drink mixes. Giveaway Alert! Four Sigma Foods will be providing one lucky winner with a package of all their amazing products. The winner (always from the drjoey.com database!) will be contacted by one of our team members. In a small bowl, whisk together the shallots, mustard, lemon juice, lemon zest, honey and olive oil. Season with salt and pepper to taste. In a large bowl, toss together the shredded kale and toasted almonds. Add as much dressing as desired, tossing to combine, then add the cheese and toss. Place in fridge for 1-2 hours and serve. Fill large bowl with cold water and squeeze lemon juice in. Trim artichokes and place artichokes on steamer rack in large pot with water filled just below rack. Cover and bring water to a boil. Reduce heat and simmer for about 10-15 minutes until outer artichoke leaves are easily removed. Once cooked, remove artichokes from pot and slice them in half. Remove prickly part. Brush with olive oil and season with salt and pepper. Put artichokes on grill or BBQ for about 5 minutes to get them tender and charred. Preheat the oven to 450 degrees. Cut 4 sheets of aluminum foil into squares that are 3 inches longer than your fish. Oil the dull side of the foil with olive oil and place a trout, skin side down, on each square. Season both sides with salt and pepper and open them out flat. In a bowl combine the tomatoes, garlic, olive oil, salt and pepper to taste and spoon mixture over the middle of each trout. Place 1 or 2 sprigs of thyme on top, and fold the two sides of the trout together. Drizzle olive oil over each piece of fish. Place each packet on a plate. Carefully cut across the top to open it, taking care not to let the steam from inside the packet burn you. Gently remove the fish from the packet. Sprinkle with parsley or thyme and serve, passing the lemon wedges. Each year, I pick up this easy to read book and re-read as a good reminder on how to live your best life. In his book, author Don Miguel shares 4 simple truths that effectively help you feel more joy and live in the moment. 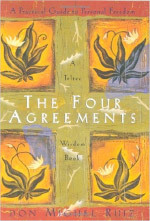 Wisdom passed on from his Toltec ancestors - this is a must read book for all.